The E/A variety does not appear on the market very often, especially in grades above XF. Mint state examples are nearly non-existant perhaps with only 5 or so examples all squirreled away deep in collections. 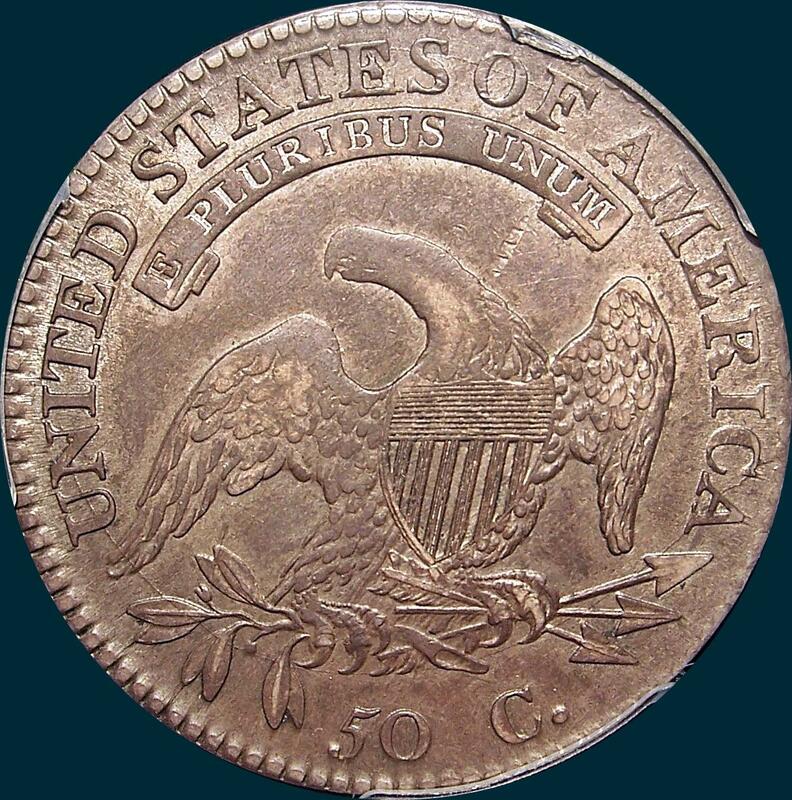 One needs to reach deep into pockets to find all the change necessary to land one of these, especialy since it is prized by Redbook collectors and Nuts alike. 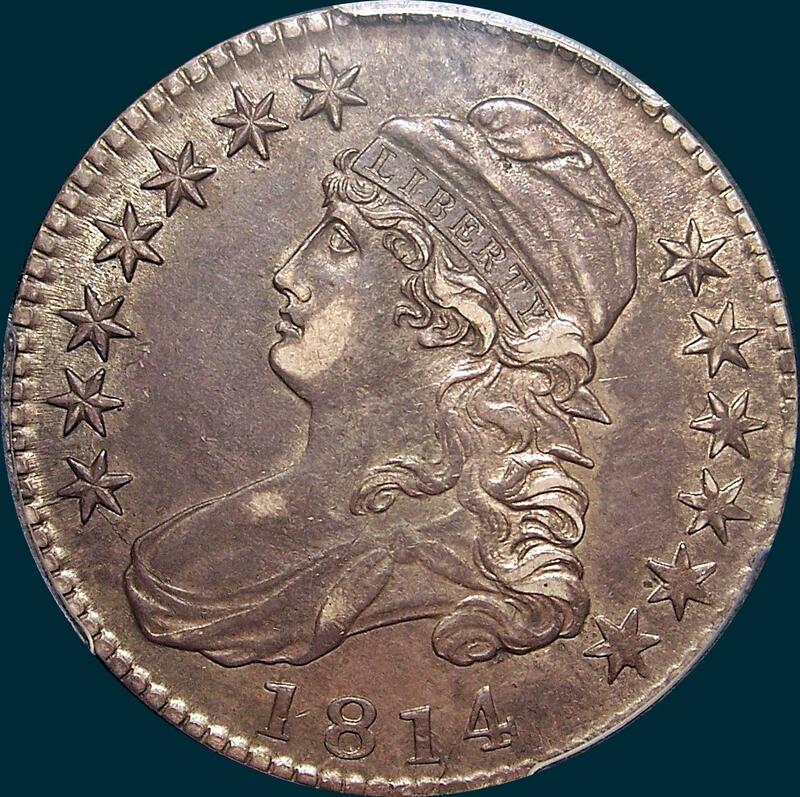 The earlier die state may be more of an R5 judging by the amount of appearances it makes (see list at bottom). If you can find one without cracks on the reverse, you found a very very rare prime! Variety Attribution: Obverse-Date is 9 1/4 mm. and second 1 is much lower than other figures. A tiny round dot is attached to the inner point of star 2. Most specimens show a fine die crack from edge below second 1 across 4 and into curls. Another fine crack crosses bust through star 1 to star 2. O-108a: Die crack from edge below second 1 across 4 and into curls. Another fine crack crosses bust through star 1 to star 2. A third crack from top of 18 left to drapery. Reverse-50. C is 2 1/2 mm. and low. Arrow to A is 3/4 mm. 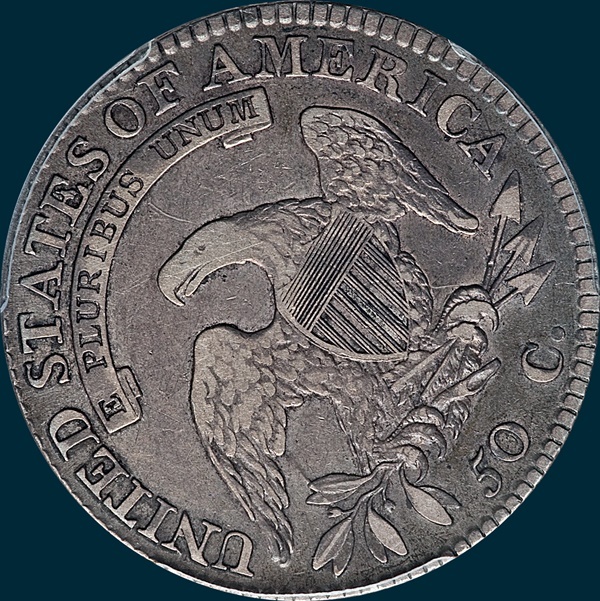 E in STATES cut over A, base of A can be seen between ES and right side of A along serif of E. A bold defect line crosses upper pair of olive leaves. Eagle's head and part of upper left wing are usually smooth. Fine die crack from N across leaves, claws, arrows, to edge above C. Die crack crosses leaves, tip of wing and UN. Another fine crack at base of ED and up through STATES to center of F all the way through AMER. Upper notch of N in UNITED partly filled. Lower right serif of F recut. O-108a: All cracks are now heavier. the small crack at ST now extends to AMER. PCGS Graded AU50. 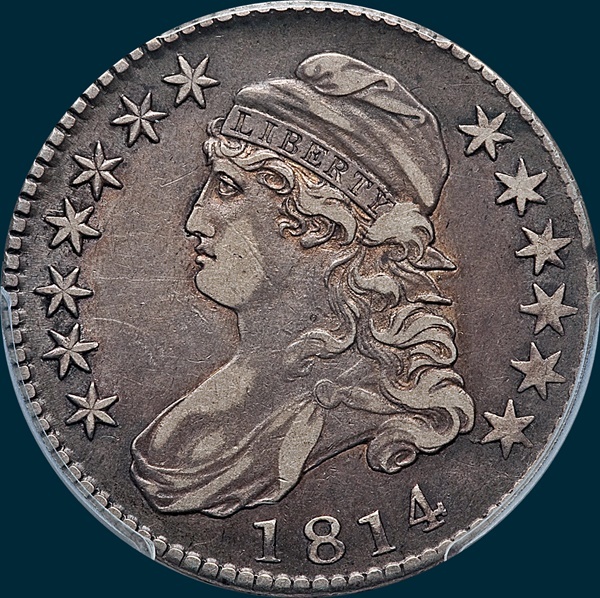 A fine gray toned example of a very tough to obtain variety, even though technically not rare. The eagles head is very weak, which is somewhat typical for the variety. A row of segments are above the eagle's neck below the scroll, not really sure what they are from. From Heritage: The sole die marriage with the blundered E over A in STATES. 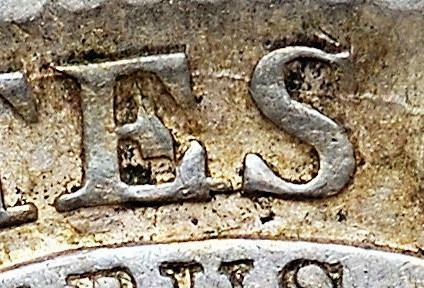 Retrograde lettering was entered by hand into working dies prior to 1836, and such mistakes were inevitable. The present piece is toned deep gunmetal-gray. Marks are limited to a minor reeding impression above the eagle. The eagle's head is softly impressed.